← I was so Freshly Pressed! As a follow up to my post on “Will Allen – Planting the Seeds of the Future,” (which amazingly was somehow freshly pressed!) I wanted to share an article from the Milwaukee Journal Sentinel that gives a look ahead into what Growing Power’s next giant step will be. If you already buy into the urban agriculture movement and organic farming, it is only going to grow higher and higher, literally. 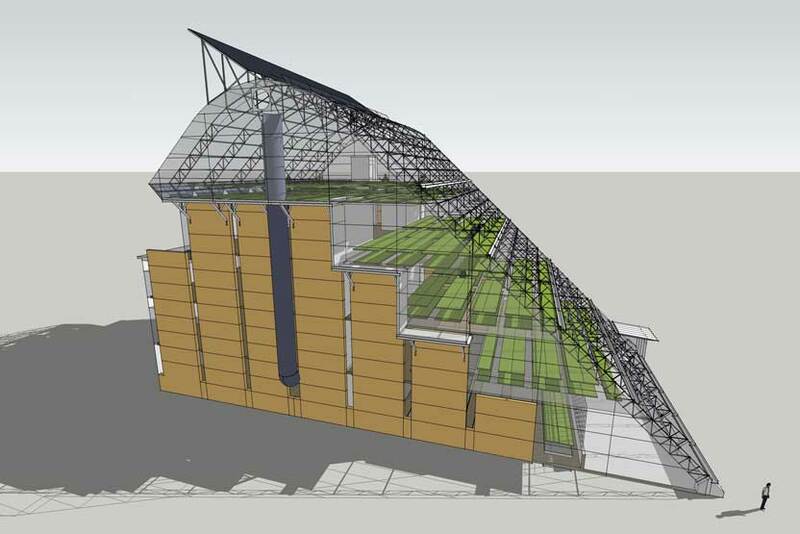 Please read the amazing article below by Karen Herzog of the Journal Sentinel, about the proposed 5 story vertical farm that will soon be occupying Growing Power’s property. Enjoy. Backers say the futuristic urban farm designed to intensively produce vegetables and fish could become an icon for Milwaukee, and a model for cities around the world to grow affordable, healthful food close to consumers. It also could create a whole new industry with thousands of jobs for urban farmers and those who design and build city farms around the world, Allen said. Images: The Kubala Washatko Architects, Inc.
“It’s something a bit counterintuitive with the economy going south, but we’ve come to the conclusion that Growing Power is going north,” said Jerry Kaufman, board president for Growing Power and a professor emeritus of urban planning. “There aren’t too many Will Allens around, and so far we haven’t developed the science to clone him. 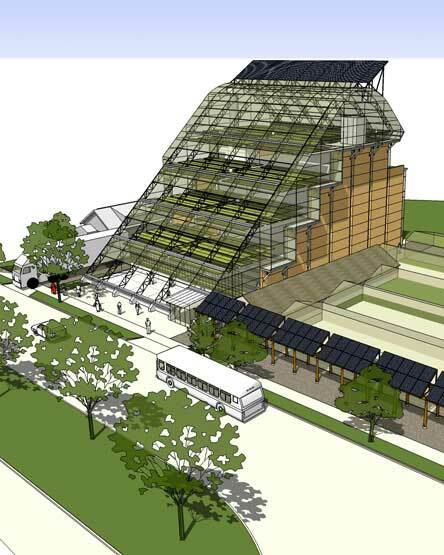 The vertical farm – dramatic in shape and with an expansive, sloped glass front to absorb natural light – would be built at Growing Power’s existing 2-acre farm at 5500 W. Silver Spring Drive through local and federal donations and grants. 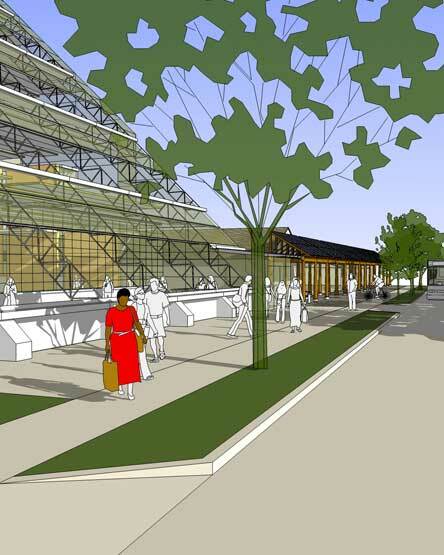 A half-dozen existing greenhouses would be preserved as historic structures. 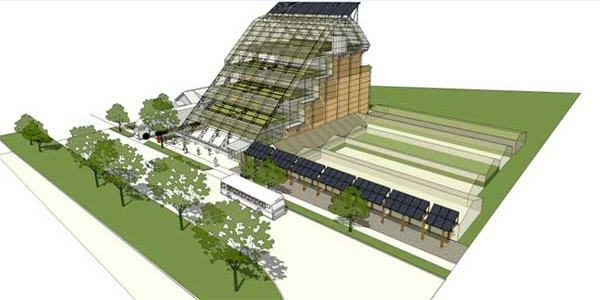 The vertical farm is conceptualized in drawings by Kubala Washatko Architects Inc. in Cedarburg (my hometown! ), whose designs have included the Urban Ecology Center, the Iron Horse Hotel and the Aldo Leopold Legacy Center near Baraboo – buildings known for their strong connections to neighborhoods and use of natural light and building materials. Image: The Kubala Washatko Architects, Inc.
It’s time to stop dreaming and start building, Allen said. Allen, 61, for years has been calling attention to the widespread existence of “food deserts” in cities across America, where whole communities lack access to fresh, nutritious, affordable food, and underserved populations have high rates of obesity, diabetes and heart disease. He keeps a hectic schedule – which will slow down in two weeks when he has knee replacement surgery. He speaks at workshops and universities around the world. Growing Power’s board members heartily applaud Allen but privately worry that he will be in even greater demand as he continues to gain a higher international profile. This entry was posted in Architecture, Cities, Food and tagged Cedarburg, Food Revolution, Growing Power, John D. and Catherine T. McArthur Foundation, Journal Sentinel, Karen Herzog, Kubala Washatko Architects, Milwaukee, organic farming, urban agriculture, Will Allen, Wisconsin. Bookmark the permalink. Hey there fellow Wisconsiner (Wisconsinite? I never know). Hey fellow Sconnie. Thanks for reading some of my posts, and I am glad you liked them! I have been to Sweet Water Organics once yes and only hope to return. I am almost certain their work is inspired off of Growing Power, but with more of a focus on aquaponics. Hope all is well in Wisco!